The Arts Disability Forum keeps developing its exhibition program along the criteria prevalent in the contemporary art practices, while making use of social links, in this case, the 7th Outburst Queer Arts Festival. As if reading Lessing’s Laokoon, they avoid any sign of propaganda, avoidance that I enthusiastically support. 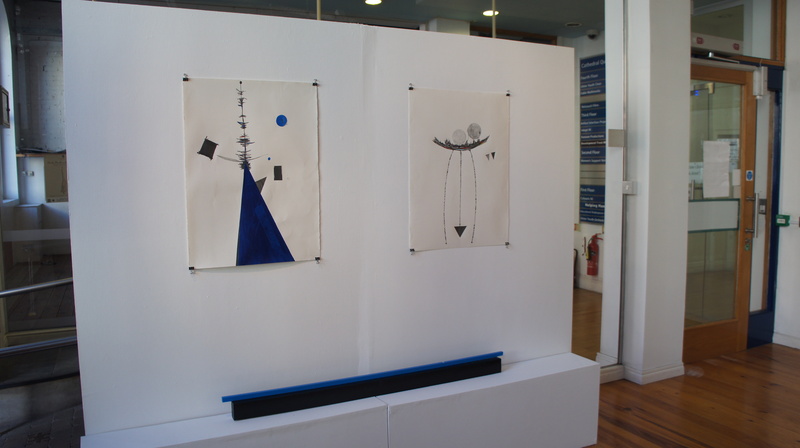 The display embraces a calm confidence into the objects, setting them on the perimeter of the space, with the exception of the blue stack- up- sort of table, literally dependent on balancing the gravity with its untidy parts. 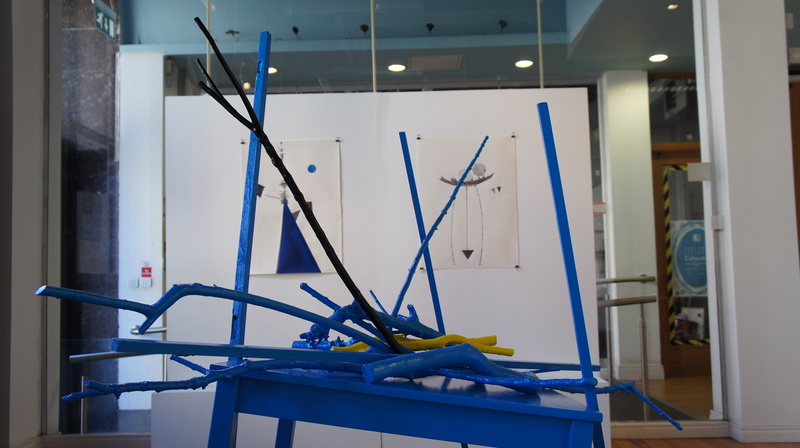 An echo of Anthony Caro (Early One Morning, 1962,Tate Gallery, London) – achieved by diligently collecting found objects, painting most of them blue (a nod to Yves Klein) and then assembling them so that they will stay in a position without any glue or nails etc. Achieving stasis by upsetting right angles, perpendiculars and horizontals, looks easy once it is done. Moreover, the disheveled object exudes no instability. This disabled table is smiling, managing, compensating an object, commanding the floor space as a giver, not a victim. A metaphor for those who live with disabilities? If so, it gives a welcome support. The blue colour is supposed to house calm, even melancholy, and some of it is perceivable in the chord with the wooden floor. Nevertheless, this blue is life affirming. This becomes obvious when other objects painted blue are considered. They are mostly old tools, or bits of plumbing. Installed on the back wall in a staccato rhythm of high and low in an open composition, they are reminiscent of musical notation. 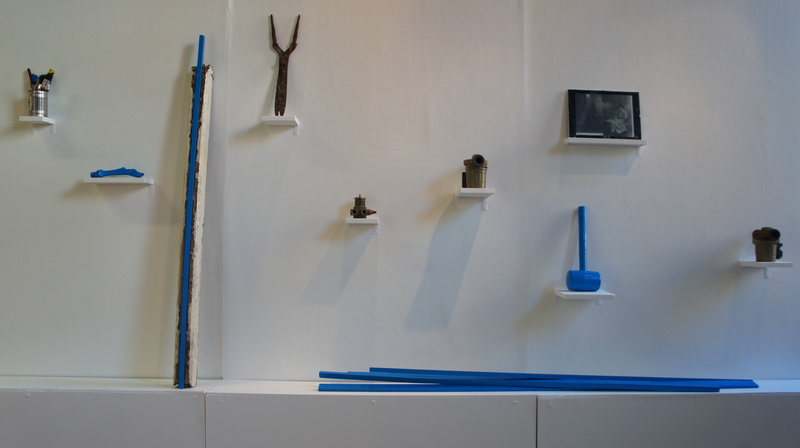 From the left: a tin with brushes, each saturated with one of the colours O’Donnell used in this installation, reminds the viewer of the tin with brushes cast in bronze by Jasper Johns. Both work as sculptural objects, but only one is easily dismantled. O’Donnell targets the aesthetics of ordinary work, the brushes are like any in your homes, left without cleaning to harden through time. 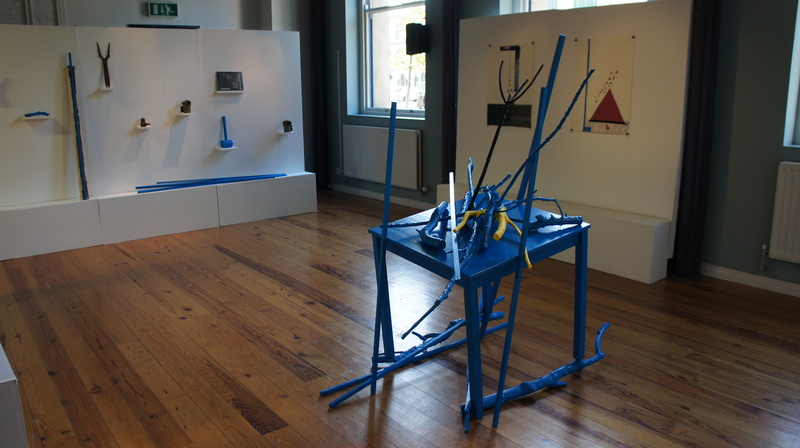 Time is evoked not only by the title of the installation, but also by the objects selected. Rusty garden sheers were dug out by chance on a family plot. The pipes and the hammer and the photography also come from O’Donnell’s predecessors. The blue sticks he once carried walking the streets in a public performance. Each of the objects has a past. Distributing them on small shelves suggests that the viewer should treat them as art objects, but more importantly, the wall so composed contributes powerfully to the installation, because each object is just a part of the whole. They are not titled or dated, to forge the continuum. All deal with passage of time, not in any sentimental way, rather as signposts for the past to enter the present. The drawings gently echoes that idea. 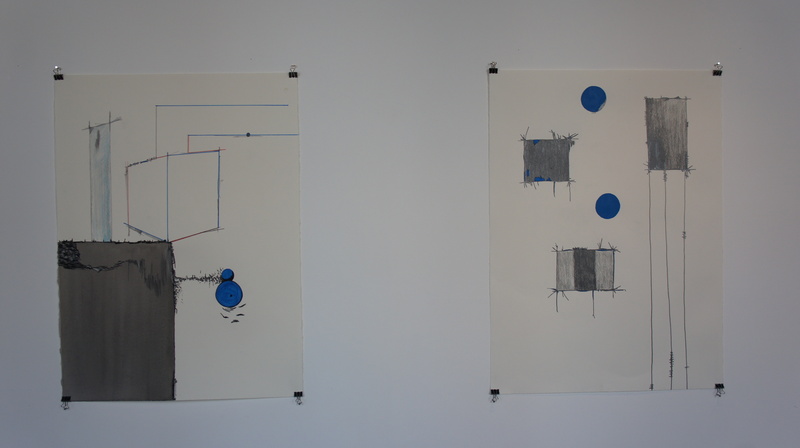 Two and two on facing walls, and two on the wall adjacent to the entrance, the drawings are quiet witnesses of the assembled three-dimensional objects. 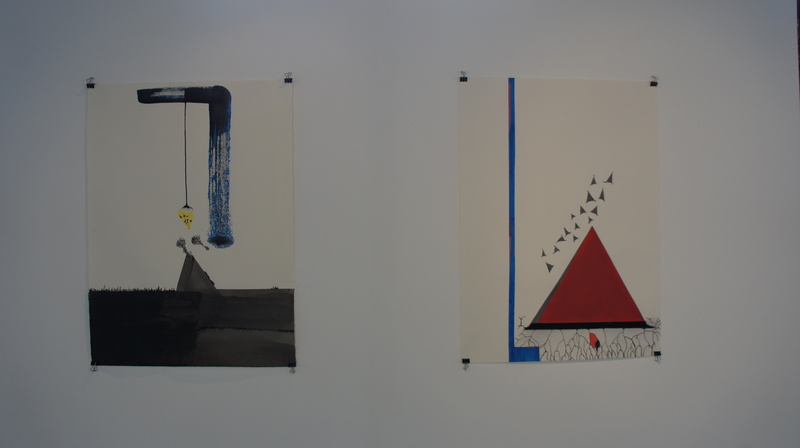 The light open compositions include time in diverse manner: a static balancing yellow weight is getting ready to move, while over at the red pyramid a flock of dark triangles tries to get a lift on a wind. The blue circles enliven the rectangles without overwhelming the drawing’s secure simplicity. The installation elegantly juxtaposes art and life offering sensual delights and plenty of inspiration and space for your own passing thoughts. 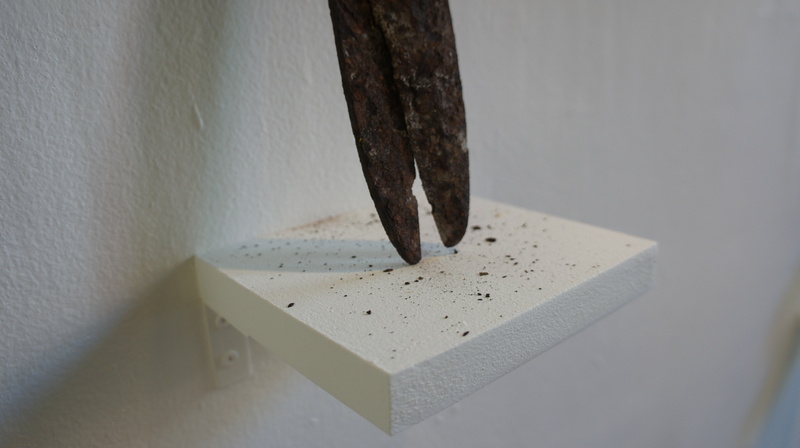 On November 16th at 6pm Hugh O’Donnell will be performing Erratic Memory. 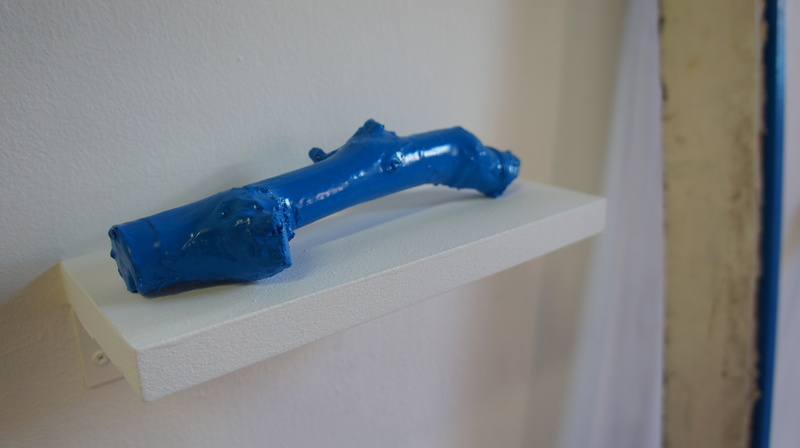 This entry was posted in essay, review and tagged blue paint, disability, drawing, found objects, found photography, installation, Jasper Johns, Performance Art, sculpture, table, W Kandinsky, Yves Klein. Bookmark the permalink.